Things will be good, but they won’t be easy…a brief update. Things are a little dead out here at the airport. Today would feel warm if not for the wind; it’s been pretty fierce out here today. It’s the sort of day when recreational pilots don’t go up in the air; only my dad, who has almost 10,000 hours of flight time behind him, seemed to have bothered to go anywhere today. Jeremiah and I spent the morning at the ranch, helping L and her husband move some bigger furniture then trimming toenails on one of the especially difficult llamas. The present owners/caretakers are leaving on the 12th of this month. We will be in charge of the animals after that, but, looking at the sheer number of their belongings still in the house, I have a feeling that we wont actually be able to move in until June or July. They will be back in town on and off throughout the summer, to see family and pack more. They plan to have everything completely moved out in August. You might say things are complicated. Until we can move into a full room or two, and have unhindered access to key areas (like the kitchen, bathroom, etc), we won’t really be able to stay there. That means we’ll be caring for all the animals from offsite. While I will have more time for ranch work, as I will be done teaching at the end of the week, it still indicates nearly two hours everyday just in commuting. With so much going on, it’s getting difficult to prioritize everything that needs to be done. If I’m being honest, I’m getting pretty overwhelmed, and I don’t see it getting much better anytime soon. It looks so peaceful, doesn’t it? *OH! But I did find out that I have a trip to Florida in my future! Jeremiah finally has a farrier clinic in a fun location, so I’m going with him. The 2nd week of June can’t come quickly enough. I cannot wait! Previous Keep the glass. Hand me the bottle. Next Endings and new beginnings. Hang on… there is opportunity right around the corner. You just can’t see it yet! think a break in Florida will be just what you need! Hopefully a break in a beautiful place will rejuvenate you. *I..somehow that *I was cut off. 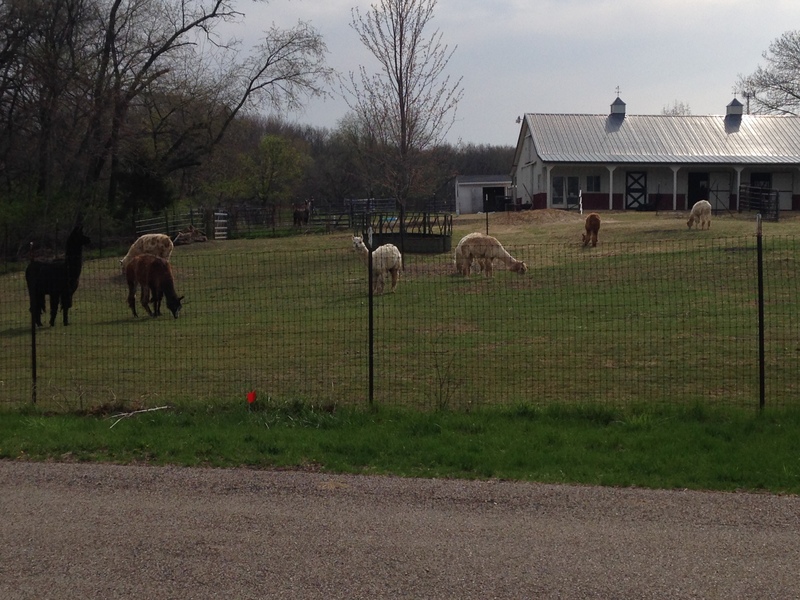 I used to help neighbors shear their alpacas and llamas. That’s when I clearly understood the phrase ‘put a sock in it’. That’s precisely what I had to do because they have deadly aim when they’re mad and spitting. Ugh, if I remember right, the stuff from the third stomach is nasty, stinky stuff. It really is. Luckily, most of mine pretty well behave themselves for shearing. The spitters are usually the ones we do for other people. Oh I wish! Mine can be royal pains, but most do tolerate shearing very well. They are trained and socialized fairly well as a whole. Here’s what shearing mostly looks like for us.